I came across Old Jawad the other night while trying to find a recommended Indian restaurant (Rani Mahal – look for a review very soon). I was seriously tempted to skip the original restaurant and try Old Jawad instead. It’s a very elegant restaurant tucked into a corner near the Opera. The menu included the basic Indian dishes, with a mixture of meat and vegetarian options. The interior is beautiful and the menu promises a fusion of traditional and modern touches. The prices were also very reasonable. You should be able to have a good meal, minus wine, for under 20 euros a person. I found a few reviews; the following one in French summarizes the attention to luxury and food. Idéalement situé face au théatre des Bouffes Parisiens, le Old Jawad est un indo pakistanais de qualité. La décoration, chic juste ce qu’il faut et moderne, donne une ambiance chaleureuse et cosy. On jouit largement de l’espace avec des tables bien disposées où on ne profite pas de la conversation des convives voisins. Le service est très efficace et sympathique et en plus l’apéritif et le digestif sont offerts. Une bonne adresse avec un rapport qualité/prix excellent. How can you pass up a restaurant that bills itself as “Le premier Restaurant, Brunch, Salon de Thè non-fumeur et hètero friendly de Paris!“? 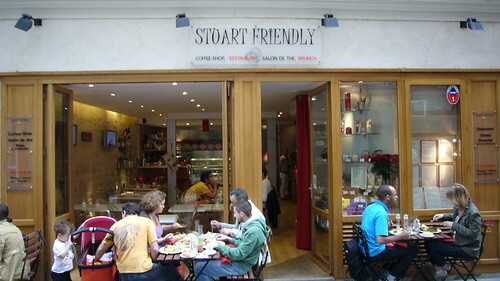 Stuart Friendly is a friendly restaurant just off of Rue Montorgueil in the Marais district. Their menu is filled with light, fresh, seasonal dishes. There are several options for the vegetarian and vegan visitor. I didn’t have a chance to eat here the night I discovered it. However, the portions looked generous, the food looked great, and the customers looked happy and satisfied. I guess that makes for some friendly eating. Paris has amazing restaurants. That’s a given. But there’s much more for the foodie tourist. You can learn how to cook, spend hours in farmer’s markets, shop for equipment with professional chefs, and buy tons of books for your kitchen back home. Librarie Gourmande is a bookstore for you to visit. 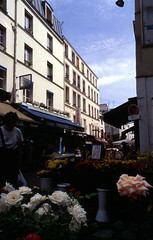 Librarie Gourmande sits in the foodie triangle, near Chatalet Les-Halles. The owner of the shop also has a popular blog: Les Agapes de Débo. It’s filled with recipes, product tests, musings on Paris food and much more. She has compiled a list of unique vegetarian recipes with easy to follow photographs. The recipes are in French and have metric measurements, but you should be able to reproduce them easily.